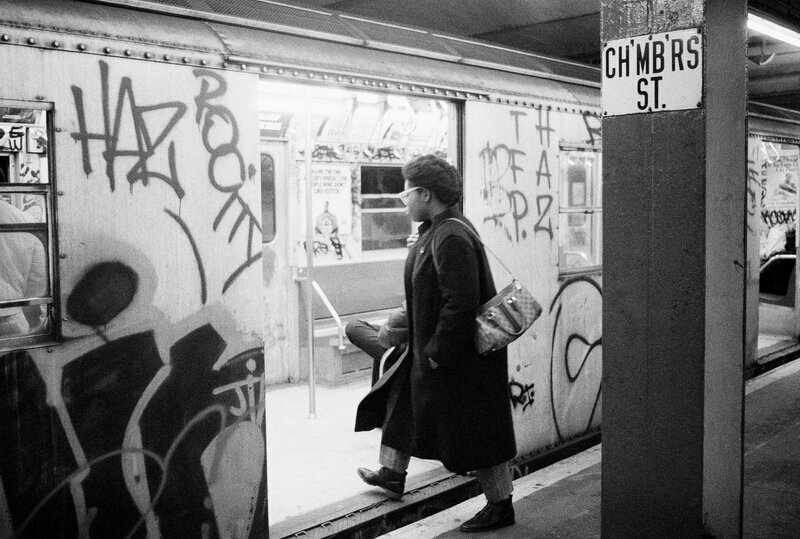 A passenger boards a subway car painted with graffiti, in New York in 1984. These were the words uttered by painter Jean-Michel Basquiat, who was deeply shaken after he heard the story of a black graffiti artist who was beaten to death by New York City police. Seeing his own life reflected in the death of a fellow artist, Basquiat went on to create Defacement (The Death of Michael Stewart),not only to commemorate the young man’s death, but also to challenge the state-sanctioned brutality that men of color could face for pursuing their art in public spaces. The events that shook Basquiat and inspired Defacement happened 30 years ago. In the early hours of Sept. 15, 1983, aspiring artist and model Michael Stewart left the Pyramid Club in Manhattan’s Lower East Side and headed for the First Avenue and 14th Street subway station to catch a train back home to Brooklyn. As he waited for the train, the slender 25-year-old allegedly pulled out a marker and began scrawling graffiti on the wall, probably not noticing that transit police were watching him intently. The events that followed are not entirely clear, but at 3:20 a.m., he arrived at Bellevue Hospital in police custody, hog tied and badly bruised, with no pulse. Hospital staff managed to get him breathing again, but they couldn’t bring him out of a coma. Thirteen days later, he died in his hospital bed, all because he tagged a subway wall. The city had declared a “war on graffiti” years before, waging a costly, and even sometimes violent, effort to eradicate graffiti from the city, but as details of Stewart’s murder became known, many New Yorkers were shocked by the sheer brutality of it. District Attorney Robert Morgenthau pursued indictments against some of the transit officers involved and presented a disturbing sequence of events, which included two separate beatings — one outside the train station, another outside the police station where Stewart was originally taken. Witnesses saw police hitting Stewart, who was handcuffed on the ground, with billy clubs. As he was screaming for help, officers kicked him repeatedly, even choking him with a nightstick until those screams turned to silence. His arms and legs were finally bound behind his back, at which point witnesses saw the police throw his listless body — which weighed a mere 140 pounds — into a police van for transport to Bellevue. “His body was seen by some to fly through the air before it landed in the van’s storage compartment,” court documents said. As an attorney for the Stewarts noted when the case finally went to trial, the defendants, judge, jury, attorneys on both sides, and even the court officers were all white. Only the victim himself, unable to tell his story, was black. And so, in a scenario that has played out in some form many times since, all six of the officers were acquitted and a black family was reminded that justice is anything but blind. Michael Stewart’s case was emblematic of the widespread police brutality faced by people of color in New York City at the time (in 1983, there were even congressional hearings held on the subject), but it was also an early indication of the way authorities in New York and across the country would respond to hip-hop culture, which in many ways evolved in response to the oppressive environments faced by young blacks and Latinos. Ultimately, with the help of razor wire fences around train yards, police “vandal squads” (infamous for the beatings they sometimes delivered to graffiti artists they caught), and even attack dogs, New York authorities were able to all but destroy the graffiti movement in the city, thereby restoring order in the minds of the many citizens who shared Glazer’s sentiments. However, just as graffiti was being quelled into submission, other elements of hip-hop culture were exploding in popularity, pushing the movement into the American mainstream and continuing to provoke an institutional response characterized by aggressive policing. Nowhere is this clearer than with rap music. Although it was not overtly political in its early days, by the late 1980s, artists such as NWA and Public Enemy changed the direction of the genre. With their seminal albums Straight Outta Compton and It Takes a Nation of Millions to Hold Us Back, both released in 1988, they launched blatant attacks against America’s power structure, taking particular aim at law enforcement agencies. Public Enemy’s logo — a silhouetted man in cross hairs, donning a Black Panther-style beret — offers a visual representation of what happened when rappers resurrected the militancy of their Black Power predecessors. NWA, for example, found themselves and their record label targeted for intimidation by the FBI and local law enforcement agencies after the release of the song “F- – – tha Police,” as did other acts that released anti-police tracks in the years that followed. Even rappers who took a less combative posture found themselves on the wrong side of the law. In the late 1980s and early 1990s, for instance, artists such as Too Short, LL Cool J and 2 Live Crew — who shocked and alarmed audiences with their (hyper)sexual depictions of black masculinity — were arrested for obscenity when they would perform songs that local authorities deemed too sexually graphic. With some hip-hop performers raking in millions of dollars per year, many others pretending to, and a few — like Jay Z, Common and Diddy — even rubbing shoulders with the president, it may be difficult to see the movement in a historical continuum that includes the persecution of young men like Michael Stewart. But alongside its seduction of mainstream America, hip-hop has continued to draw its ire. One example, a subject that I write about frequently, is the practice of using rap lyrics as evidence in criminal trials to put people in jail. In many cases, especially those involving amateur rappers, prosecutors will present juries with a defendant’s rap lyrics, arguing that they should be read as literal evidence of criminal wrongdoing, or at least a criminal disposition. (In fact, I am currently serving as pro bono expert witness in two such cases.) Even with little other evidence, jurors (particularly those harboring fears of the violent, hypersexual man of color that rap lyrics routinely glamorize) often have no trouble convicting. It happens with alarming regularity, a reminder that while the tactics of repression may have changed, hip-hop artists who end up in the legal system’s cross hairs continue to face steep penalties for their art. Although Michael Stewart became something of an icon to many graffiti writers — a kind of hip-hop martyr whose death inspired works by Basquiat, Keith Haring and others — it’s a role that his 84-year-old mother, Carrie Stewart, resists. After I finally worked up the courage to contact her, afraid that I might drag to the surface memories she’d just as happily keep buried, we spoke for more than an hour, and while she was eager to talk about her son, she was reluctant to consider him within a tradition of graffiti or associate him with the hip-hop movement that graffiti culture helped to initiate. Instead, she wanted people to remember him in a much broader history of black suffering and white brutality, invoking names like Emmett Till, Eleanor Bumpurs and Trayvon Martin. Full of strength and composure, and remarkably free from bitterness, Mrs. Stewart never took her eye off the political significance of his death. Citing New York’s stop-and-frisk laws and the ongoing abuses faced by people of color nationwide, she said she wanted people to remember that her son fell prey to an America that victimizes young men like her son “all the time.” Her voice quavered only once, and it wasn’t when she recounted the terrible night of Michael’s death; it was when she reflected upon the abuses that still persist, even after 30 years. But one thing has changed since 1983: Hip-hop is now a powerful global force, one that has endured in the face of powerful resistance and, at its best, has drawn attention to injustices in the U.S. and abroad. Dozens of artists, including Public Enemy, dead prez, Jasiri X, The Game and Cassidy, released tracks decrying the murders of Sean Bell, Oscar Grant and Trayvon Martin, keeping their memories alive. Now, as we hit the 30th anniversary of Michael Stewart’s death, perhaps it’s time for a couple of tracks in his honor, too. I’m sure his mother would appreciate it.